Apologies for the delay in posting this next installment of the series, but between going to two conventions and being heads-down trying to get Adventures Great and Glorious done in time for the Kickstarter, things have been hectic! 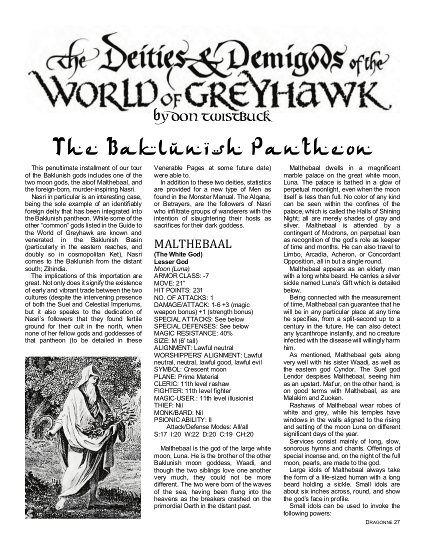 But now I continue my series of articles on the Baklunish Basin to the north and west of the Flanaess, with another installment of articles from that repository of what might have been, Dragonne magazine. This time out, we have two more gods of the Baklunish, including the savage and foreign Nasri, as well as details on the various tribes of the Paynims, including their names, strengths, leaders, and where these nomadic wanderers are inclined to make camp in both summer and winter. You can get the latest installment here. Enjoy! Here are links to part one, part two, part three, and part four. Finally, please consider supporting my latest Kickstarter. Adventures Great and Glorious is a book of rules for high-level and long-term adventuring, including courtly intrigue, mass combat, building fortresses and attracting followers, and much more. Compatible with most old-school games, you can drop in the parts you like, and leave out what you don’t. Terrific job, as usual, especially the inclusion of Kal– er, NASRI. A question, though… why does Malthebaal have the capability to instantaneously go to Limbo? Acheron and Arcadia make sense, but you’d think with the Modron association Nirvana would be a destination…? Whoops! That’a a typo. Should be Nirvana. Fixed file has been uploaded. Thanks! I love this installment so much. The gods are uniquely presented as always but I’m of course enthralled by your Paynim tribes and nomadic patterns. I’ve dealt with that in Ull, though now seeing it next to the enormity of the Steppes/Plains, Uli roam in such a compressed area I’m now realizing. Well done Joe. So glad you like it, Mike! That Paynim map was something I’ve been wanting to do for a while.